Function: Nourishes Heart yin, clears empty heat. Function: Frees the channels and quickens the connecting vessel, regulates Qi and blood. Function: Removes obstructions from the channel, calms the mind, clears heat. Function: Calms the mind, tonifies Heart Qi, benefits the tongue, benefits the Bladder. Indications: Palpitations, dizziness, blurring of vision, sore throat, sudden loss of voice, aphasia with stiffness of the tongue, stuttering, pain in the wrist and elbow. Function: Nourishes Heart yin, clears heat, stops sweating, calms the mind. Function: Calms the mind, nourishes Heart blood, opens orifices. Indications: Cardiac pain, irritability, palpiation hysteria, amnesia, insomnia, mania, epilepsy, dementia, pain in the hypochondriac region, feverish sensation in the palm, yellowish sclera. Function: Clears Heart fire, Heart empty heat, Heart phlegm fire, calms the mind. Indications: Palpitations, pain in the chest, spasmodic pain of the little finger, feverish sensation in the palm, enuresis, dysuria, pruritus of the external genitalia. Function: Clears heat, subdues wind, opens the Heart orifices, relieves fullness, restores consciousness. Indications: Palpitations, cardiac pain, pain in the chest and hypochondriac regions, mania, febrile diseases, loss of consciousness. The Heart meridian has the primary function of governing the blood and blood vessels of the body. It also governs the sweating function of the body, and strongly affects the performance of the tongue due to the secondary Heart energy channels which connect the Heart meridian itself with the base of the tongue. The healthiness of the Heart meridian manifests in the complexion of the skin. The Heart meridian is also said to house the spirit of the human soul, which correlates with the idea that a person "has lots of heart" if they have a strong spirit. Treats chest pain and disorders related to the rhythm of the physical heart. Improves circulation and performance of the blood vessels throughout the entire body. Calms the spirit and improves emotional wellbeing. Heals disorders of the tongue and speech disorders. This is because the Heart meridian is connected to the tongue via the secondary energy channels. Treating throat problems such as pain, swelling, and congestion. The Heart meridian is connected to the throat via the secondary channels. Treating eye problems such as redness, pain, or swelling. This is because the secondary Heart channels connect with the eyes. Improving problems with the complexion of the skin, especially on the face where the Heart secondary channels reach. The Heart meridian begins at the heart and goes outwards until it reaches near the skin of the armpit area. 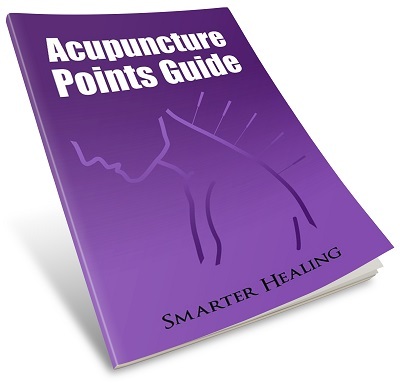 This is where the first point that is accessible with acupuncture needles, abbreviated as HT1, is located. However, the Heart meridian, like other meridians, is not just a simple line from one point at another. The meridian image above shows the points that are used in acupuncture, but there are also three aspects of the heart meridian that you should be aware of. The first is the Heart luo-connecting channel. This is a separate energy channel that separates from the Heart meridian at the point HT5 on the wrist/forearm area. This energy channel travels up the arm and into the physical heart area itself. From there, the luo-connecting channel goes straight up inside the body until it reaches the neck, where it continues up along the inside of the face until it reaches the root of the tongue, and then the further up the face until it reaches the eye. No place along the luo-connecting channel is used for acupuncture needles, but a trained acupuncturist will be aware of the energy that moves along its path. The second aspect of the Heart meridian not pictured above is the Heart divergent channel. The divergent channel is another energy pathway that begins in the armpit area around the point HT1. From there, it goes into the chest until it reaches the physical heart location, and then goes up along the throat similar to the luo-connecting vessel. From the throat, it continues up onto the front of the face, until it reaches the bottom inside of the eye next to spot between the eye and the nose. Here, it connects with the Small Intestine meridian. The third and final aspect of the Heart meridian that is not pictured in the meridian image above is the Heart sinew channel. The Heart sinew channel is not a perfect line of energy, but actually a spread out area of muscle and tissue within the body. This channel starts on the little finger of the hand right next to HT9 point of the Heart meridian. 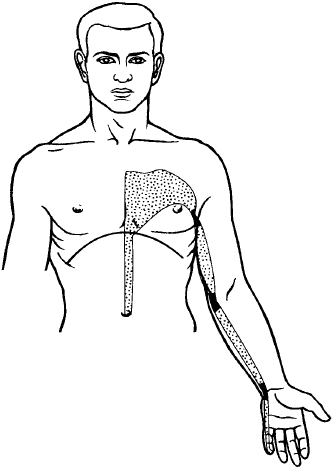 The sinew channel follows the Heart Meridian up the arm until it reaches the chest area that covers the heart itself. From there, the Heart sinew channel descends along the diaphragm in a small section in the center of the body, until it ends at the belly button.